In May 2000, Charlie along with Royal Marine companion Alan Chambers succeeded in becoming the first Brits to walk unsupported from the Canadian coastline to the Geographical North Pole (Team Polar 2000). 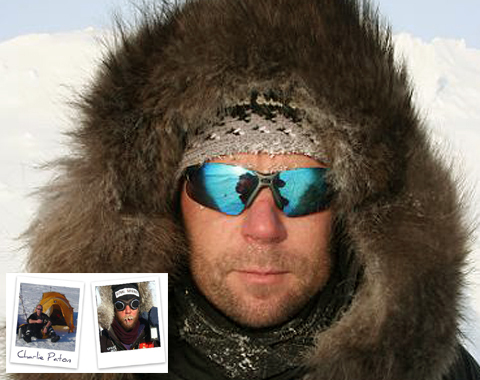 Ten years later, Charlie took part in the second expedition of the Catlin Arctic Survey. Well-known for his exploits, professionalism and willingness to share his passion and knowledge with others, specially in the polar world, Charlie Paton has founded "Extreme Outdoor Adventures’ a travel agency specialized in polar travel and expeditions. Paton : "We feel that it is our experience, background and attitude that sets us apart”. Ex-Royal Marine and ex-biathlete, Charlies years in the service gave him experience and expertise covering all corners of the globe, in some of the most extreme environments including desert, jungle and the Arctic. Charlie’s Arctic training experience ranges from Norway, the Arctic ocean, Greenland, Canadian High Arctic, Spitsbergen, Iceland, South Georgia and Antarctica. He has trekked thousands of kilometres across the Arctic and has stood on the Geographical North Pole a total of 8 times. In May 2000, Charlie along with Royal Marine companion and good friend Alan Chambers MBE, succeeded in becoming the first Brits to walk unsupported from the Canadian coastline to the Geographical North Pole (Team Polar 2000). The trip lasted 70 days, during which they pushed human boundaries both physically and mentally to achieve what was deemed impossible. Ten years later, during spring 2010, he was member of the Catlin Arctic Survey's team together with Ann Daniels and Martin Hartley. They were sent by british explorer Pen Hadow to the arctic ice pack in order to collect samples on the arctic waters (at different depths). This time the expedition's focus was on the effects of carbon dioxide on the waters of the Arctic Ocean. Charlie applies that same passion, drive and commitment to everything he does. He is a keen fitness fanatic and spent many years in the ultra fit cross-training scene where he competed all over UK and held the Scottish champion title 6 times along with many records! Charlies time in the Royal Marines gave him the opportunity to keep fit and push his limits far beyond others and excelled in most of what he took part in, he later passed the aptitude for the Royal Marine/British Biathlon Team in which he joined and enjoyed very much before a broken knee stopped him at a crucial time of competition. He went through rehab for his broken knee at one of the best rehabilitation places in UK, where he was told he would never put skis on again. At the end of the first 6 week phase he signed himself out knowing they were wrong and never went back for the remainder of rehab. He then joined his old unit at 45 CDO,RM at RM Condor Arbroath where he planned to get back to fitness himself, just at that time 9/11 occurred and the royal marines of 45cdo’s experience in the mountains was requested. Charlie not wanting to miss out but was still medically downgraded got himself fit enough in quick time to allow doctors approve his medical state back to fighting fit just in time to go out with his commando unit!He returned from Afghanistan and decide to call it a day to his 16 yr service. He retrained in sports therapy and personal training, and ran his own personal training program for many different clients, before he went on to sports specific fitness training for young sports professionals including young tennis and golf champions, as well as rugby, hockey and football teams! He then solely trained one of Scotlands most creditable drivers today (Ryan Sharp) for a number of years whilst alongside he was building up his adventure business which is now where he spends most of his time! In between expeditions, Charlie still has clients who demand his “hard push attitude” to get the required results.